Written to help therapists view their clients' questions as collaborative elements of clinical work, What Do I Say? 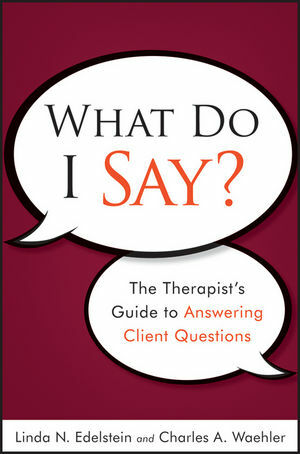 explores the questionssome direct, others unspokenthat all therapists, at one time or another, will encounter from clients. Authors and practicing therapists Linda Edelstein and Charles Waehler take a thought-provoking look at how answers to clients' questions shape a therapeutic climate of expression that encourages personal discovery and growth. The power of therapy lies in the freedom it offers clients to discuss anything and everything. It's not surprising then, that clients will surprise therapists with their experiences and sometimes with the questions they ask. What Do I Say? reveals how these questionsno matter how difficult or uncomfortablecan be used to support the therapeutic process rather than derail the therapistclient relationship. Linda N. Edelstein, PhD, is a supervisor and clinical psychologist with thirty years' experience. She has been teaching graduate students since 1987. For the last seven years, she has taught a popular graduate course entitled Adult Development at Northwestern University in Evanston, Illinois. Prior to this appointment, she was on the faculty at the Chicago School of Professional Psychology for fifteen years, where students twice voted her Teacher of the Year. She maintains a practice in Evanston and Chicago. Charles A. Waehler, PhD, is an Associate Professor in the Collaborative Program in Counseling Psychology at The University of Akron. He has taught both beginning and advanced practica, assessment courses, and classes in personality and psychopathology. Dr. Waehler is a Fellow in the Society for Personality Assessment. Throughout his academic career, Dr. Waehler has been a practicing psychologist seeing individual adolescents and adults. For the last fifteen years, he has been affiliated with Cornerstone Psychological Services in Medina, Ohio. His research interests include the counseling process and personality assessment.